If you’re looking for a real Himalayan salt lamp for your home or office, this page has a detailed review of the best salt lamps for sale and why they are recommended. First, we’ll cover medium-sized rock salt lamps, which are generally the most popular and suit the majority of lounge rooms, large bedrooms and workplaces. 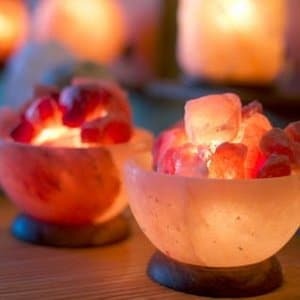 Next we will look at smaller pink salt lamps you might place beside you on a desk, in a small bedroom or on a side table next to where you watch TV. Lastly, we’ll consider larger Himalayan natural salt lamps for bigger spaces and dealing with electromagnetic smog and positive ions from electrical equipment. If you’re wondering just what a salt lamp is, why you might want to have one, whether they do generate negative ions and their other health properties, then check this page on salt lamp benefits and how they work. If you’re looking for Himalayan salt lamp reviews and where to buy high quality salt lights at the lowest price, then this page has many hours of research to save you time. It will also be regularly updated with the top new salt lamps on the market. Natural crystal lamp towers carved from blocks of real Himalayan pink salt are by far the most popular kind of salt lamps to buy. They give off a soothing and tranquil amber glow and make for a distinctive and attractive feature in any home. Let’s start with a beautiful, relaxing and healthy addition to any living space — a mid-sized pink Himalayan rock salt lamp. I’ll begin this review of salt lamps off with the very one I have on next to my work desk right now — this attractive natural cut bestseller on Amazon. The Windsor Seasons Himalayan salt lamp is a hand cut tower of deeply glowing pink/orange pure rock salt with a strong and stable Neem wood base. It stands around 9 inches high and usually weighs about 8 pounds (3.5kg) though, as each of these are handmade, there will always be some variation in size and shape. This is an authentic Himalayan salt lamp that is clearly well made and comes with a FCC and CE approved/UL certified dimmer control switch if you’d like a softer glow in the evening. The light bulb on mine hasn’t needed replacement in well over a year of daily use. When you do eventually need a replacement bulb though, remember to use incandescent bulbs made especially for salt lamps like these ones. Customer reviews are overwhelmingly positive and, while it’s not the cheapest salt rock lamp in this size, it makes sense to invest in quality when you’re buying a salt lamp. A good one like this can last a lifetime. All in all, the Windsor Seasons crystal salt lamp here on Amazon is an excellent choice and highly recommended. There’s also free delivery if you get a few other things at the same time. If you’re looking for a beautiful salt crystal lamp for your home, the only reason not to choose this model would be if you want to get a larger size or different type of salt lamp design. Let’s look at some of the best of these next. For a larger sized salt crystal lamp, that would be perfect for your lounge room or other living area in your home, the new Body Source Himalayan rock salt lamp you can see here is a great choice. This authentic natural salt lamp is hand carved and certified to come from the Himalayan salt mines in Pakistan. It stands between 10 and 12 inches high and weighs at least 10 pounds, usually over 11 and up to 15 pounds, with customer reviews describing it as quite heavy. Review pictures from the company and customers generally show these salt lights as having a more pinkish amber glow than darker orange, though of course every real Himalayan lamp is unique in its coloring. All Body Source salt lamps come fully assembled with a dimmer switch and a spare 15 watt incandescent bulb. This pink salt crystal lamp is also packaged in a classy looking gift box so could make an unusual and memorable present for a friend or family member. If you are looking for a large salt rock lamp that’s also comparatively quite cheap on Amazon and with vastly positive reviews then I’d recommend considering this model. For different and distinctive designs and some unusual colors like white and grey, salt lamp specialists So Well also have a great range of artisan made and fairtrade Himalayan crystal lamps here. The large and extra-large sizes would make for a striking feature in any lounge or living room. Good rock salt lights are harder to find above 12 pounds and especially around 15 pounds, which is close to 7kg. At this larger size, the Levoit Aurora crystal salt lamp real stands out on Amazon for its quality and value. This is genuine Himalayan salt lamp from a leading producer with an attractive stainless steel base for drainage and a special adjustable dimmer switch with extra long power cord. Levoit salt lamps are extremely well made and the Aurora is top of their range. It comes with a full 2 year warranty and even include two extra salt light bulbs and red gift packaging. Just as importantly though, this crystal rock lamp is made from a pure vein of deep pink Himalayan salt and, as one of the top sellers on Amazon with over 300 overwhelmingly positive reviews, people seem to really love the way it looks. In fact, the most common theme in the salt lamp feedback from customers on this model is just how beautiful it looks once you turn it on. You can read them and see the many pictures of this Himalayan crystal lamp in their homes here. If you want to get a real Himalayan salt lamp in a larger than normal size it’s best to go with a specialist supplier. SoWell have been importing handmade, fairtrade and certified authentic Himalayan salt lamps into the USA from the foothills of the Himalayas in Pakistan since 2004. This gorgeous, deep orange and pink, and extra large salt lamp is one of their bestsellers. It would make an eye catching feature in any living room and its larger surface area enhances its air cleaning properties vs smaller salt rock lamps. This is a big salt lamp, weighing between 16 and 20 pounds and with dimensions of approximately 12 inches high and a full 7 inches wide. It sits on a sturdy wooden base, has a UL certified dimmer switch, included light bulb and detailed care instructions. Highly recommended if you’re looking for the best large salt lamp for your home. You can see more pictures and check the price here. For a good alternative on Amazon, this elegant HemingWeigh salt lamp is great value and weighs in at between 19 and 25 pounds. It also comes with a safe UL certified dimmable lamp, timber base, free shipping and money back guarantee. Well worth comparing with a price similar to the smaller salt rock lamps reviewed above. For something different here is the newer Himalayan salt basket design. While these style of salt lamps don’t stand as high as the solid salt towers above, they do make for a unique crystal lamp and are quite stunning visually. Reading through all the information and salt lamp reviews on this type of model the best I’ve found is this amazing basket of fire design by SMAGREHO. It has large chunks of Himalayan rock salt arranged within a basket of black polished wire. Underneath is a safe UL listed light bulb with dimmer switch to heat the pink salt and activate its air cleaning properties. Actually, due to the large surface area of this Himalayan salt basket lamp, it may be even more effective at cleaning the air than other designs which don’t expose as much of the rock salt to the environment. From a visual perspective, this design is quite striking and when you turn down the lights you can see why it’s described as a fire bowl. Some reviewers even say it looks just like a pink glowing fireplace. Read the many reviews and see the stunning home pictures for this basket of fire Himalayan salt lamp here. Surprisingly low price too for such a pretty and distinctive pink salt light. Next, we will move on to the best smaller salt lamps suitable for coffee tables, work desks or bedside tables. While bigger is usually better for air cleaning, if your rock salt lamp is positioned quite close to you, say next to you at your desk while you work, as a bedroom night light or on a table near where you watch TV, it’s fine if it isn’t so big. When you buy a small salt lamp like one of these, you will usually save a bit of money and some very attractive designs only come in the smaller sizes. Here’s some of the best I’ve found. First, a metal basket salt lamp night light with a variety of patterned designs. Second up are small Himalayan salt lamps powered by USB for your work desk. Finally, another bowl of fire Himalayan lamp, but this time the bowl itself is made of glowing crystal salt. These exotic looking metal basket salt lamps come in 6 different designs. I particularly like the flame and moroccan styles but you can choose whatever suits you best. The company suggests using them as a bedroom light, bathroom illumination, kitchen feature or for meditation or prayer, and the designs really do seem fit for this purpose. They come with an adjustable dimmer dial so I’d consider these salt lamps particularly good to use as an unusual yet inexpensive night light. Customer pictures, while beautiful, do seem to show this style of salt lamp is not quite as bright as more open designs. This could be a good thing though if you don’t need the room you place them into to be too light, or especially if you’d like to use one as a Himalayan salt night light. Highly recommended if you like this sort of design. Check out the different patterns and the low price for these Himalayan rock salt lamps here. Portable and travel ready, USB salt lamps can be powered by a laptop or a desktop computer, making them particularly good to place on your work desk or in your home office. Salt lamps can counteract EMF radiation from computers and debilitating positive ions from office electrical equipment like printers and photocopiers. They also provide a warm and soothing amber glow and can provide a welcome distraction from the harsh fluorescent lighting of most workplaces. Specialty salt lamp suppliers So Well make the best USB powered Himalayan salt lamps I’ve found in both natural cut pink and rare white crystal salt lights, along with a cute globe pink salt lamp here. These inexpensive USB salt lamps aren’t that large but could be just what you’re looking for on your office desk or as an unusual gift. Another recommended salt light for your work desk or dining room table is this distinctive and beautiful fire bowl lamp. Unlike the other Himalayan lamp basket design reviewed earlier, the bowl that the blocks of salt rest in is itself made out of the same pink crystals. This means it too will glow with pink and orange colors when you switch on the light. These high quality, artisan made Serenity bowl salt lamps come in both orange amber and rare white Himalayan salt, can be used as aromatherapy essential oil diffusers and make for a unique feature with a soothing glow. While natural cut Himalayan pink salt crystal towers are by far the most commonly purchased style of salt lamp, many new designs now being created. Shaped globe and pyramid salt lamps with a smooth polished surface are particularly popular, but cubes, teardrops, love hearts, obelisks and all manner of other salt rock lamp shapes are also available. More rare are genuine white Himalayan salt lamps mined from special viens of ancient salt in foothills of the Himalayas in Pakistan. Let’s look at these next. Offering a quite different atmospheric feel, pure white crystal salt lamps provide a stronger glow than regular ones and could be a better choice in rooms where you’d prefer a brighter luminescence. In terms of color therapy, real white Himalayan salt lamps are a bit more active and energizing than amber ones. Their white crystal light signifies healing and cleansing, both physically and emotionally, and releasing of negativity. By comparison, the softer pinks and oranges of regular salt lamps represent calmness, relaxation, positivity and love. Pink rock salt lights are also considered cleansing and healing to your emotional and physical body in color therapy. They are just a little gentler and it may take a bit longer to feel the effects from them than the more high energy white salt crystals. One important warning with white salt lamps is that there are a lot of fakes out there. An authentic Himalayan white salt lamp is a rarity and if is is cheaper than regular salt lights and comes with colored light bulbs then it’s unlikely to be from a high quality source and could be a fake. The surest way to find a real white salt lamp is to get one from a specialist supplier that guarantees their product’s origin. So Well have the best value range of genuine Fair Trade white crystal salt lamps available online. They are mined and created at the foothills of the Himalayan mountains and come in a wide variety of shapes and sizes, all expertly made and of the highest quality. For a different and very stylish and exotic look, Himalayan salt lamp pyramids and polished sphere salt lamps make for a distinctive feature in any home. If you think a pyramid salt lamp (or two) would look good in your home, this stylish handcrafted lamp is the best I’ve found. It is smooth polished, comes with a certificate of authenticity and also has a 90 day money back guarantee just in case it’s not what you were looking for. These pink pyramid salt lights have a wide and steady timber base and a hollowed out interior for the included 15 watt light bulb with a 6-foot UL-listed power cord. Something to be aware of with a pyramid lamp versus the previous salt lamps reviewed though is that they won’t stand nearly as high due to the much wider base. Review pictures of this exotic salt lamp in people’s homes do show just how good these can look though. If you are searching for something different and like the pyramid design these salt lamps make for an attractive feature. If you like smooth finished and shaped salt lamps like this, then another recommended design to consider buying is this stunning sphere-shaped Himalayan rock salt lamp. Like a pink crystal ball of fire, this hand carved globe salt light has a adjustable dimmer switch and would make for a gorgeous and quite mystical looking Himalayan salt lamp night light. High quality rock salt lamps in the larger sizes are more difficult to track down in 2019. I found this 100 lb monster Himalayan salt crystal tower on Amazon from BlackTai, which would make for a standout visual feature at the entrance to a wellness center or yoga studio. Though if you are looking for a giant salt lamp that really makes a statement then I’d recommend buying from a specialist producer for the best price and highest quality. These huge and visually stunning pink crystal salt lamps from So Well come in two sizes, the extra large 35-50 lb salt rock lamp and a truly giant 80-100 lb Himalayan salt crystal tower. So Well hand pack all customer orders in recycled packaging, their deliveries are fully insured and they provide a 30 day satisfaction guarantee should you need to exchange or refund. One of these huge salt lamps can last a lifetime, so it makes sense to make sure you get the best quality and a guaranteed genuine Himalayan crystal salt lamp for this kind of purchase. While extra large salt lamps do look amazing, another more affordable option is to get multiple salt lamps and place them in different parts of a large room for combined air cleaning. For a combination of great price with premium quality, it’s hard to go past this pretty pair of HemingWeigh pink crystal salt lamps. They come with 15 watt bulbs, dimmable brightness switches and extra long UL-certified cords and make great presents for friends that would appreciate something special in their home. Having multiple salt lamps in a room is not only visually striking, it will also be even more beneficial from a health point of view than just one large one. For the ultimate Himalayan salt lamp combination package, have a look at these discounted Healthy Living 4 sets and packs of 3 in amber, grey and rare white crystal salt lamps from So Well. I hope this review of the best Himalayan salt lamps has helped you to find a beautiful and health giving new edition to your living space. Please share it with friends who might be interested in where to buy salt lamps, what to look out for and avoid and the different designs, colors and sizes available. Also, make sure to read this article if you’d like to know more about the health benefits of salt lamps and how they clean the air in your home.